Because concrete and rebar construction is extremely strong, it is used in all kinds of buildings, from residences to storefronts to factories. Commercial and industrial demolition projects often contain hundreds of tons of concrete. Rather than send all of this valuable material to landfills, concrete demolition contractors can break it into smaller pieces that may be used in a variety of projects. Jaw crushers. At their most basic, jaw crushers use the same technology as a nutcracker. They crush debris between two vertically oriented “jaws,” which are tapered to allow only smaller material to pass through. A flywheel powers the jaws, which open and close just like a mouth. Concrete demolition contractors list versatility; ability to process abrasive materials; and lower maintenance costs as advantages to jaw crushers. Impact crushers. While jaw crushers use pressure to break up concrete, impact crushers rely on impact (as their name implies). Some impact crushers throw the rock against hard surfaces with such velocity that the rocks naturally break along internal fissures. Other impact crushers use hammers on the outer edge of a spinning rotor to break up materials. Industrial and commercial demolition contractors cite easy replacement of parts; effective severance of wire mesh and rebar; and versatility as the strengths of impact crushers. Cone crushers. These are less common, but they’re used in some parts of the country. Their basic shape is a cone whose open base accepts rock. As the demolition materials filter down toward the tip of the cone, they are crushed between two internal layers – one that is fixed and another that is mobile. The advantages of cone crushers include low operation costs; ease of adjustment; high productivity; and hardy construction. Fee d material. Can the machine process only concrete, or may other materials be mixed in? Production rates. Each machine has its own productivity pace, typically described in tons of material processed per hour. Equipment size. Machine dimensions determine storage and transportation options. Environmental considerations. City or state laws may restrict how much dust a demolition site can create. Different crushers produce different amounts of dust during operation. In general, jaw crushers produce less dust than hammer crushers. Output size. This determines how the materials may be used. Roadways, parking lots and sub-base each have their own fill size requirements. Oftentimes, a series of crushers is used to achieve smaller and smaller fill. Moisture content. Jaw crushers cannot accept sopping wet materials, but cone crushers can as long as the material isn’t sticky. Emergency shut-off. Look for a hydraulic toggle retaining device, which will turn off the machine before damaging materials can cause harm. As you peruse potential crushers for your demolition business, keep these qualities in mind. Your intended use of the crusher will determine which characteristics are most important and which can be de-prioritized. If all of this seems like too much work, partner with Elder Demolition for concrete processing. 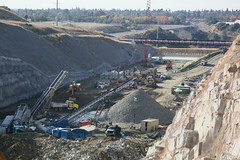 We maintain a line of crushers; indeed, we are one of the largest concrete processors on the West Coast. Call us today to turn that concrete waste into valuable fill. This entry was posted in Commercial Demolition, Concrete Crushing & Recycling, Industrial Demolition and tagged commercial demolition, concrete demolition contractors, industrial demolition. Bookmark the permalink.